A full campsite on a Saturday. For those of us that travel the road, weekends are a special time. It is not because we can finally get away from it all — because we do that every day. But that is the time when we must share the campgrounds with weekend campers. Many campsites are reserved by people who plan their special camping trip for months in advance. Others may be filled by locals who enjoy camping on weekends. For those who are traveling the country, it is difficult to plan in advance. You don’t know if you need extra time for maintenance, to spend more time in an exciting area, or if you need to rest from a cold or illness. Sometimes we cut short our time in an area due to weather conditions or even smoke from a local wildfire. We have a problem scheduling more than a week or two in advance. All this means that there are times when you can’t find a campsite on Friday or Saturday nights. These are options to keep in mind. 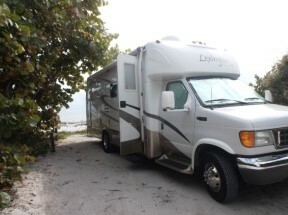 A cancellation meant we could stay at this campsite in the Keys. You may not be able to make a reservation a month in advance, but you might be able to guess your location a week or a few days in advance. Sites like Reserve America allow you to look for campgrounds in the area that have sites available for specific days. Keep checking back on these sites for openings as people cancel. 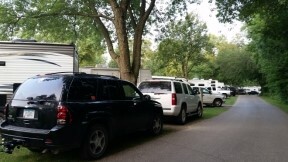 Ask if there are openings at the campground where you are early in the week. Extending your stay may be your best option, especially on holidays. 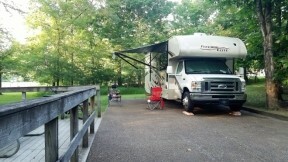 Walk-in camping at Mammoth Cave National Park. Some campsites are marked for walk-ins (no reservations). This may mean showing up at the campground on Friday morning. We sometimes come in on Thursday just to get a spot on weekends. 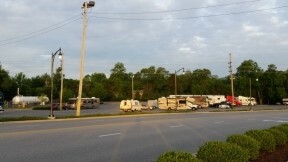 Some campgrounds are known for long lines of people waiting for an open spot. You can call ahead to get a feel for how quickly these spots fill up for a weekend. We are members of Good Sam, Passport America, KOA, and Harvest Hosts. We use phone apps from these or other websites like Campendium.com. One of these options should have openings. Also, you can try free camping options using websites like freecampsites.net. Memorial Day weekend at a casino. When all else fails, use free blacktop campsites like Walmart, Cracker Barrel, Cabela’s, rest areas, or casinos. Remember that these tend to be limited to one night. One time for a Memorial Day weekend we stayed one night at a Walmart and two nights at a casino. Do you have any tips to find a spot during weekends?